From clockwise from bottom-left: Cardona from Carr Valley in La Valle, WI, Evalon from LaClare Farms in Chilton, WI, Landjaeger with Door County Cherries from Zuber’s in Monroe, WI, and Eleven Brothers from Boston Post Dairy in Enosburg Falls, VT. The grassy, herbaceous flavors of goat cheeses are complemented by the sweet and salty counterpoint of the landjaeger sausage studded with Door County cherries. The Cardona is soft and meltingly rich. The Evalon presents clean and clear flavors of goat milk, aged to a firm texture. The Eleven Brothers, a rind washed goat cheese, has a texture similar to a Pecorino Romano with all sorts of nutty, grassy flavors bursting through in the long, lingering finish. I can hardly claim that a rural Vermont farmstead dairy is part of Great Lakes Cuisine, but it it is a kindred spirit. Simple, full flavors. Pair with a Sprecher Mai Bock when in season or a Bell’s Two Hearted Ale, which each balance the strong goat cheese flavors with a balance of hops and malt flavors. We’re happy to add another Minneapolis, MN entry to our Restaurants list – The Sample Room with chef Geoff Hausmann at the helm (hat tip to contributor Tom Kuckhahn). Chef Hausmann partners with a number of local farms and operates a scratch kitchen. There are also ties to the local brewing tradition, including the convenience of being located a half mile from the old home of Grain Belt Brewery, which is now brewed by August Schell in New Ulm, MN. 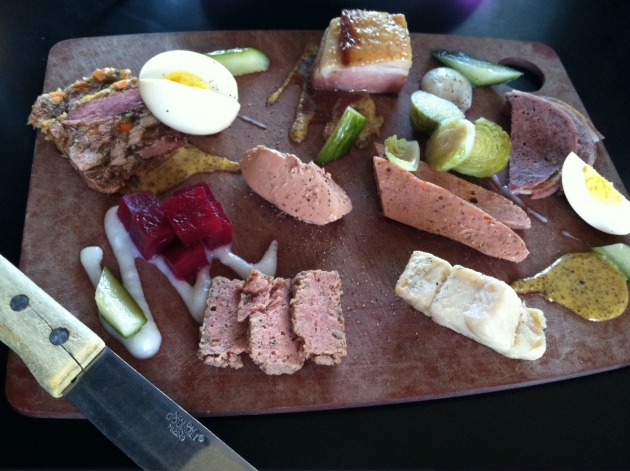 The charcuterie selection alone is reason to go, featuring a number of iconic options such as liverwurst and headcheese, supplemented with house-made beer mustard and pickles. For the heartier appetite, a bison/beef/pork meatloaf with smoked ketchup could always be paired with the hand-cut fries. Just looking for a snack with a selection of craft brews? How about bacon fat popcorn? Seriously, how did I not think of this? Of course it is brought to another level given that they make their bacon in-house as well. Overall, The Sample Room is a welcome addition to our list of restaurants continuing the Great Lakes Cuisine tradition.